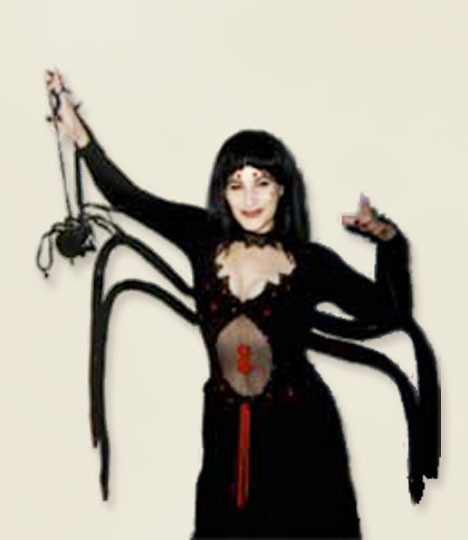 This is Part 2 of a two-part photo gallery featuring Dina Lydia, the Costume Goddess. 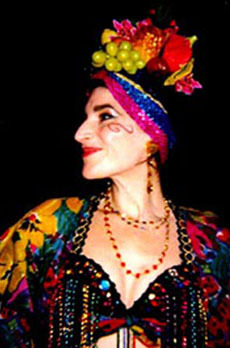 Dina has contributed over 50 articles to this web site. 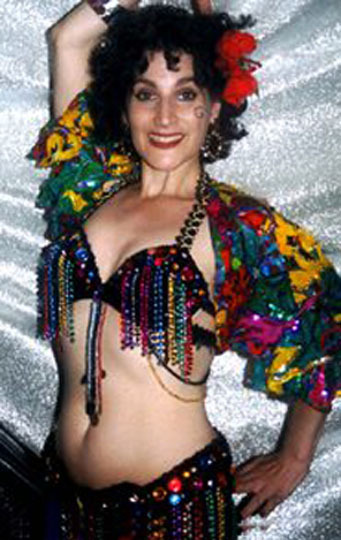 Here in Part 2, she showcases some of the novelty "just for fun" belly dance costumes she has made for herself and others. Part 1 models some of her more typical belly dance costumes. 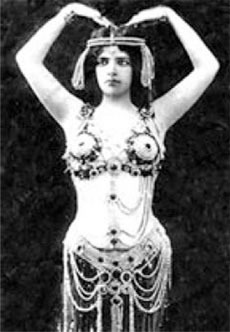 Yemaya asked Dina to help her make a costume similar to the one worn by dancer Maud Allen, who was famous for her Visions of Salomé production in the early 20th century. 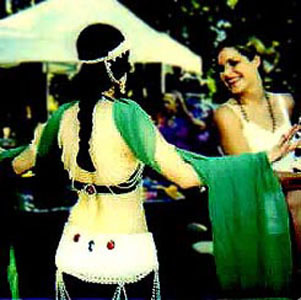 Maud Allen's promotional poster appears in the photo on the left below. 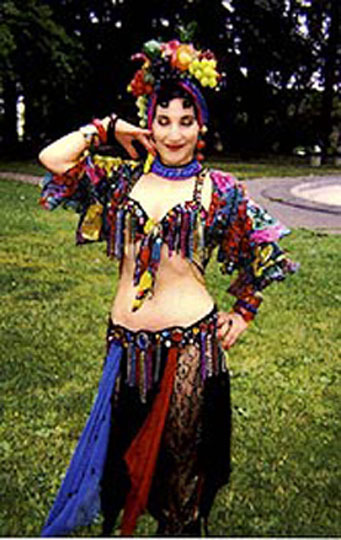 Yemaya's version is breathtaking in iridescent liquid green with draped ropes of pearls, pearl belt and bra adorned with pearls, red, green and purple jewels and rhinestones, and green silk chiffon veil. Yemaya made the pearl headpiece and arm bracelets herself. Click on the photo of Maud Allen to the left to see it in more detail. 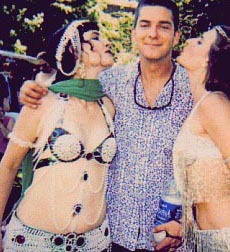 In the photo on the left, the beauty on the right is Mahira and the lucky guy in the middle is Mahira's husband Ian, at Seattle's Mediterranean Fantasy Festival, July 1998. 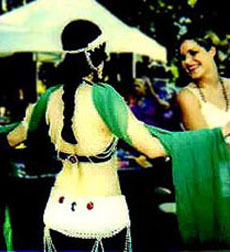 The photo to the right shows a back view of Yemaya wearing her pearl costume, chatting with her sister Robin. Click on either photo above to see it in more detail. 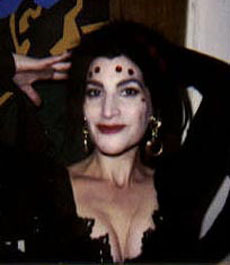 Dina's warrior princess costume consists of black leather skirt, boots and gauntlets, chained and studded bra and belt hung with skull, skeleton, tooth and hatchet and goddess pendants, Arabic dagger in sheath and scabbard, studded armband and sword, and artistically placed battle scratches. She wore this performing to the music "Ancient Days" by Raja, which appeared on Atea's "Fast Moves" video. 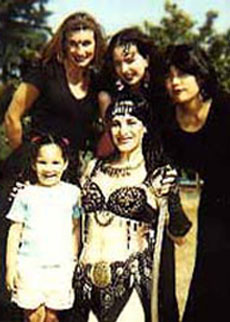 These photos show Dina's "Warrior Princess" costume with additional poses. This is a black widow spider costume complete with boy-toy. If you look closely you can see the red hourglass on Dina's tummy. 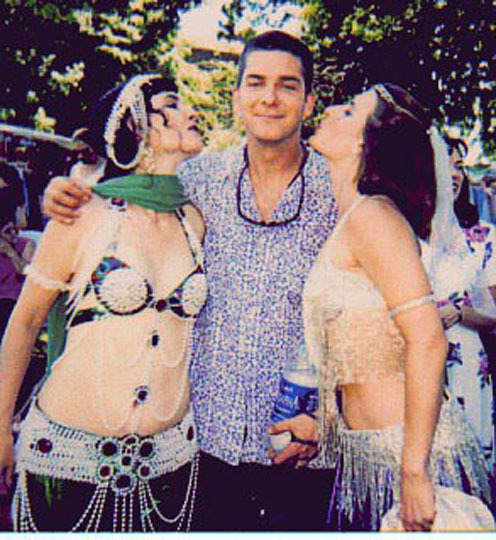 Click on the image to the right for a closer view. 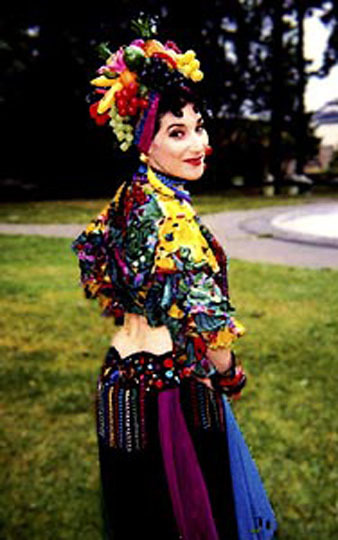 When Dina designed this costume, she was belly dancing to "alternative" Latin music and obviously inspired by Carmen Miranda. 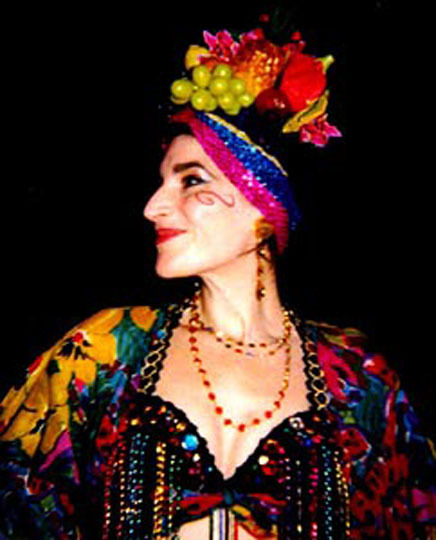 This is the same multi-colored costume shown in Part 1, with the addition of calypso sleeves and a fruit and flowers headdress. Click on either photo to see it in more detail. 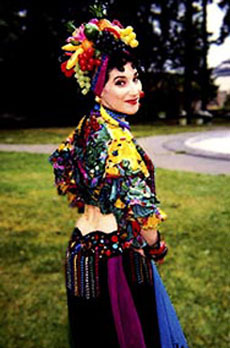 This concludes Part 2 of 2 of the photo gallery of Dina Lydia, the Costume Goddess. Click here to view Part 1.